The Editor have been invited to speak at the annual "International CBRNe Workshop" organized by the University of Rome Tor Vergata (International CBRNe Masters Program). The Editor (as member of the IMPRESS consortium) will lecture on the PSC Europe Forum Conference (23-24 Nov 2016) and the Joint Workshop by CONCORD and IMPRESS EU Projects (Nov 22, 2016) to be held in Athens, Greece. The Editor will participate (as CBRN consultant) at the Live Demo/Drill of EU EDEN Project organized from the Gemelli Policlinico, Rome. The Editor was invited to present at the Horizon 2020 Project TOXI-triage organizing a workshop/master class (Sept 12, 2016; Helsinki, Finland) on integrating technology innovation into SoPs and Operational Specifications for CBRN Crises Management. Topic: "Me, the Medical First Responder". The Editor will be visiting Gemelli Policlinico (preparation for the Sept 2016 live drill), International CBRNE Institute (organizational issues) and Abu Dhabi, UAE (delivering CBRNE-related classes). The Editor officialized his involvement as the NEW Manager of the CBRN Knowledge Center at the International CBRNE Insitute in Belgium. The Editor participated (as CBRNe consultant for the Gemelli Policlinico, Rome) at the "Integration Workshop" organized by the EU EDEN Project at Gemelli Policlinico. The Editor delivered 9 classes on CBRNE threats management and preparedness for the RSF Hellas Volunteer Rescue & Telecommunications Team, in Athen, Greece. The Editor as member of the EU IMPRESS Project's consortium actively partiipated at the Live Demo organized in Palermo, Sicily - Italy, with the collaboration of national Civil Protection takeholders. The Editor as meber of the KEMEA participated in the End-Users Workshop of the EU SECINCORE Project ((Secure Dynamic Cloud for Information, Communication and Resource Interoperability based on Pan-European Disaster Inventory) organized by the Lancaster University, UK. The Editor participated (with 5 lectures) at the annual WMD6000 Course organized by the NATO Maritime Interdiction Operational Training Center at Souda Bay, Crete Island, Greece. Editor will conduct the second series of lectures at University of Rome "Tor Vergata" - International CBRNe Master Courses. Editor will lecture at 2015 CBRNe Symposiet in Oslo, Norway. Topic: "CBRNe Mapping - Is the threat real? During that time he will deliver two additional lectures at Oslo Medical School and Oslo University Hospital, Uevall. Editor has been invited to give the annual lecture on CBRNE issues for the MSc program “Crisis Management, Mass Destruction and Emergency Situations” of University of Athens, Medical School (moderator: Prof George Saroglou, MD). Editor has been invited as key speaker at the 41st ICMM World Military Medicine Conference to be held at Bali, Indonesia. Topics: (1) CBRN Forensics; and (2) Are miitary hospitals prepared to deals with mass CBRNE casualties? Editor will address radiological threats' related issues at the "EU IMAGES [JRODOS] Project Workshop for First Responders & Scrap Industry" organized by the Institute of Nuclear & Radiological Sciences & Technology, Energy & Safety of National Center for Scientific Research "Demokritos" in Athens, Greece. Co-Editor Dr.Steve Photiou will address issues related to hospitals' preparedness in management of major crisis at the 2-days Intensive Workshop "Hospitals in Big Crises - Are we Ready? 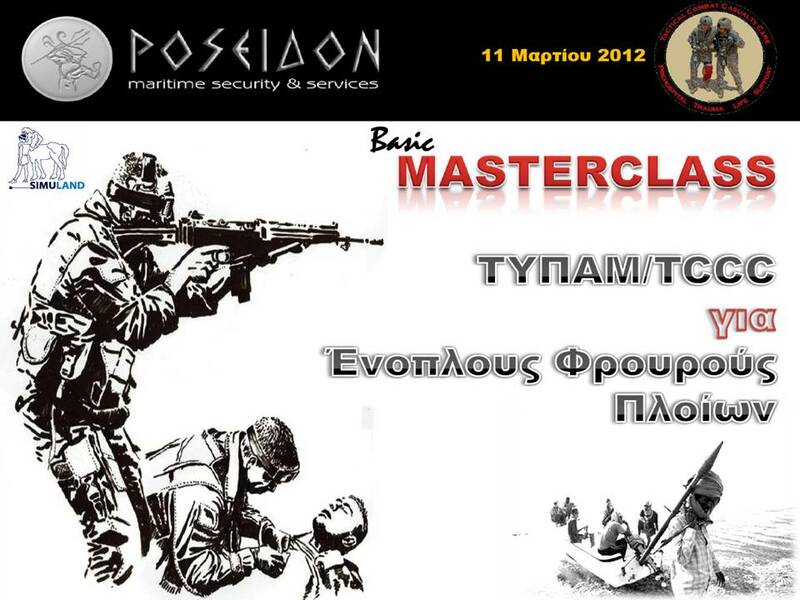 ", co-organized by Athens Medical School and Naval Hospital of Athens (workshop's venue). Co-Editor Dr. Steve Photiou lectured on "Emergency Preparedness and Drug Stockpile in case of CBRN Attack" at the "CBRNE Summit" (25-27 Feb, 2015) held in Rome, Italy. Editor participated as invited end-user CBRNE expert (KEMEA) at the "EU PROACTIVE Workshop" held in Milano, Italy and organized by Consortzio MIlano Richerche and Univerity of Milano Bicocca. Editor will conduct the first series of lectures at University of Rome "Tor Vergata" - International CBRNe Master Courses. Editor invited to deliver CBRN-related lectures at the "WMD 6000 Course" organized by the NATO Maritime Interdiction Operational Training Center (NMIOTC), Chania, Greece. Editor invited as end-user CBRNE expert (KEMEA) at the EU POP ALERT Workshop held in Brussels, BE. Editor participated as lecturer on CBRN hospital preparedness at the 1st International Conference of Military Medicine "Contemporary Problems of Military Medicine" organized by the Armenian Ministry of Defense and the Armenian Military Doctors Association in Yerevan. CBRNE-Terrorism Newsletter signed a MoU with University of Rome, "Tor Vergata" to provide media support and CBRNE experts for the International CBRNe Master Degree programs delivered by the Italian University (OPCW and NATO supported). Editor addressed "CBRNE/Terrorism Intelligence" issues (5 hrs) at the 2014 Executive Training Program on “National Security and Intelligence in the Mediterranean Region" organized by the Research Institute of European-American Studies (RIEAS) and the Potomac International Center for Terrorism Studies of Potomac Institute of Police Studies (USA), in Athens, Greece (07 – 10 July 2014). Editor was honored by RIEAS with the 2014 "Minas Ioannis Nomikos" Award for Security Research Excellence. Editor has been invited to deliver two CBRN-related lectures at the NATO School Oberammergau, Germany. Editor will deliver two CBRN-related lectures and a case-study at the "WMD 6000 Course" organized by the NATO Maritime Interdiction Operational Training Center (NMIOTC), Chania, Greece. Co-Editor Dr Steve Photiou, MD will chair the Pre-conference Disaster Medicine Workshop on "Chemical and Biological Weapons" at the 3rd Global Networkon Emergency Medicine Conference to be held in Dubai, UAE. Editor has been invited to speak at the 2014 ICPEM Conference (April 3, 2014), London University College, UK. Topic: “CBRNE Hardening or Soft Targets - Airports, Shopping Malls and Luxury Hotels”. Editor has been invited by Directorate General of Civil Defense - Dubai, to lecture at the "4th Fire Safety Technology Forum UAE" in Abu Dhabi, UAE on "C2BRNE Threats and Resilience Strategies". Editor will address issues of "HAZMAT/CBRN medical consequences" at the experts' training course organized by the Qatari National Committee on Prohibition of Weapons (NCPW) in Doha, Qatar. Editor will participate as lecturer to the workshops organized by EUROMED Police III Project to be held in Athens, Greece under the auspices of Hellenic Police and Ministry of Interior (18-22 Nov 2013). Editor has been invited to participate as lecturer at the October conference of TINYg held in London, UK (more details will follow). The Terrorist Information New York Group (TINYg) is an international forum delivering free membership and information to all members. Up to the minute information from all corners of the globe is shared in order to assist organizations with combating terrorist threats. Regular meetings of TINYg are held in both London and New York and graced by a host of renowned international speakers. Coordination: Dr. Alexandre Bello- UERJ, ANBio Core Issues: Biosecurity to big events: World Cup and the Olympics; mechanisms of security and access to biological materials in research institutes; disinfection of big venues; control of food and feed; identification of suspicious materials; strategic areas for monitoring; coordination of actions among different stakeholders. Participation of invited Latin American countries and international speakers. As a result of the workshop it will be prepared a document to be given to the Government as a contribution of specialists on Biosafety and Biosecurity for the management of big events. Newsletter's Co-Editor Dr Steve Photiou will moderate "Disaster Medicine" pre-Congress Workshop at "7th Mediterranean Emergency Medicine Congress" held in Marseille, France. Editor will organize the 2013 "Hospital CBRNE Preparedness Masterclass" in London, UK (July 9th) and will also participate at the CBRNe Conference (10-11 July: Chairman - July 10 & speaker: July 11), organized by SMi Group Ltd.
Editor has been invited to present at Border Management and Technologies Summit (2-5 July, 2013; Istanbul, Turkey) that will discuss the latest immigration laws and the latest systems being employed to lower the risk of illegal activities taking place on their borders including access controls, biometrics, ABC, Surveillance, Profiling and CBRN Detection. 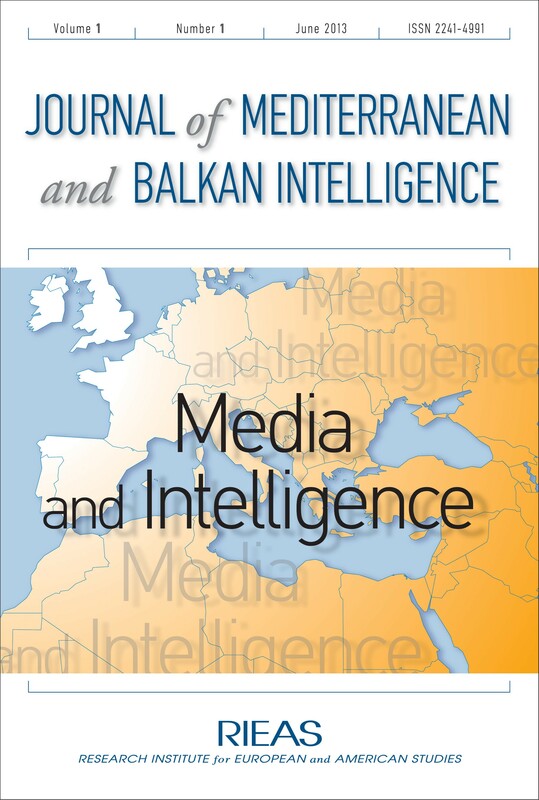 The Journal of Mediterranean and Balkan Intelligence (JMBI), which is sponsored by RIEAS has been launched today. JMBI is published twice a year and invites manuscripts that offer greater intellectual diversity in intelligence-related issues. The Journal aims to serve as a medium for intelligence scholars and practitioners to exchange views on all aspects of intelligence studies and influence both scholarly debates and policy- making. The Editor of the Newsletter is a Member of the Editorial Board of JMBI. Editor of Newsletter has been appointed as Member of the Editorial Board of the Journal of Mediterranean and Balkan Intelligence (JMBI) - a new publication of the Research Institute of European & American Studies (RIEAS) based in Athens, Greece. Next issue of JMBI focuses on “Media and Intelligence” and will be published in June 2013. The Editorial Team welcomes another prominent colleague that accepted our invitation to be an International Advisory Co mmittee member. Dr. Je Kan Adler-Collins was born in the United Kingdom and entered the British Military at the age of 18 where he trained as a Registered Nurse in the Royal army Medical Corps. Medically discharge in 1990 he developed an interest in Complementary and Alternative Medicine and how they could relate to nursing practice and education. He served on a Government Steering Group which started him on his life work of researching standards and teaching in Complementary Alternative Medicine and healing. His studies have taken to many different cultures and countries and in 1995 he became ordained as a Japanese Buddhist priest of Shingon Shu ( Koyasan) and brought his Buddhist research into his practice of a nurse in terminal care. He took his PGCE at Bath University College in 1997 and Masters in Education in 2000 at Bath University in Education with a focus of educational curriculum design and moved to Japan in 2000 where he started to build his own temple and healing center in the mountains of Kyushu, South Japan. He worked with living action research approach to education and life esquires and completed his PhD at Bath University in 2007. Working as an associate professor of nursing at Fukuoka Prefectural University he introduced the first healing curriculum for Japanese nursing using safe touch, and body work. In 2007 he moved to the Associate professor position of a health Promotion Center at Fukuoka Prefectural University with a focus on developing community training and course in health care and CAM resulting in opening the first end of life care center ran by community therapists for their own community. His temple offers retreats and healing and the first stages of a hospice have just been completed. He is the Associate Εditor of “International Nursing Review” and has keen interest in crisis management, CBRN issues and gap analysis. Editor has started a professional collaboration with an Abu Dhabi, UAE security consulting firm (Jernas Solutions). Initial series of CBRNE-related courses will be delivered to police officers of "Ports and Airports Police Department" at Abu Dhabi's International Airport camp. Editor has been invited to lecture at the International Seminar " Evolving Support of Technology for the New Dimension of CBRNe Threat" to be held in Rome, organized by OSDIFE. The Editorial Team of the Newsletter is becoming even stronger! We welcome new Co-Editor George Kiourktsoglou, BSc, Dipl, MSc, MBA, PhD (Cand. ), Part Time Lecturer, University of Greenwich (Eng. School), London, UK. George Kiourktsoglou obtained his B.Sc. in Mechanical Engineering in 1992 from the Aristotelian Technical University of Thessaloniki in Greece. As an intern, he worked for the Israeli Public Corporation of Electricity. Having concluded his military service he went to the U.S.A. to study Nuclear Engineering and Applied Physics at Cornell University. From the latter he graduated in 1996 with an M.Sc.. From 1996 till 2009 he worked for Royal Dutch Shell both in Greece and abroad, assuming various roles in Downstream Marketing, Strategy, Negotiations and eventually in Health, Safety, Environment and Security (H.S.S.E.). Sponsored by Shell Hellas, he graduated in 2006 from Alba in Athens with a Diploma in Management and two years later with an M.B.A. in Shipping from the same College. Currently he is doing research, as a Ph.D. candidate at the University of Greenwich. His field of interest is Maritime Security with a special focus on the “Piracy around the Gulf of Aden and the Horn of Africa”. George is a member of the American Nuclear Society, the Chartered Management Institute and the Institute of Marine Engineering, Science Technology in London. He speaks Greek, English, German, Japanese and French. The Editorial Team of the Newsletter would like to thank Co-Editor Nikolaos Kokkotas, MSc for his contribution to the Newsletter and wish him best in his new endeavors. At the same time, the ET would like to welcome his successor, Dr Sarafis Pavlos, Captain RN (ret'd) who is joining the team. Pavlos has a complex background ranging from nursing and public health all the way to crisis management and mass disaster emergencies. It is an honor to have him with us and we are sure that he will further boost the rising course of the Newsletter. Editor has been invited to give a series of lectures at the Joint Intelligence School (Senior Analysts Course) of the Hellenic Armed Forces General Staff. The Newsletter welcomes Colonel (Retd.) H R Naidu Gade, Chief Consultant, CBRNe Secure India as a member of the International Advisory Committee! An engineer, and a security professional, with about 40 yrs of rich experience (10 years international) in the field of Combat Engineering, Chemical, Biological, Radiological, Nuclear and Explosives (CBRNE) Defence, Security & Disaster Management. He is a qualified CBRN and EOD specialist. He led teams of international professionals on a large number of verification missions to various member countries, to verify the inventory of Chemical Weapons and monitor their destruction. He logged many hours operating in heavily contaminated environments at the CW Destruction Facilities around the globe. He is presently the Chief consultant – CBRNe Security and Disaster Management with "CBRNe Secure India" a "Not for Profit" organization involved in bringing awareness in the general public, governmental and corporate entities on the threats arising from the use of CBRNe material and their disastrous consequences. Editor has been invited to give a series of lectures (5 hrs) at the Athens Bomb Squad (TEEM) for the EOD personnel of this organization. Editor has been invited to deliver a lecture at the "Emergency Preparedness and Response 2012" Conference that will take place in Manchester, UK. The topic will be "Urban CBRNE Preparedness". More info in due time. Editor will be among the speakers at the "CBRN in the Maritime Environment" Conference in London. 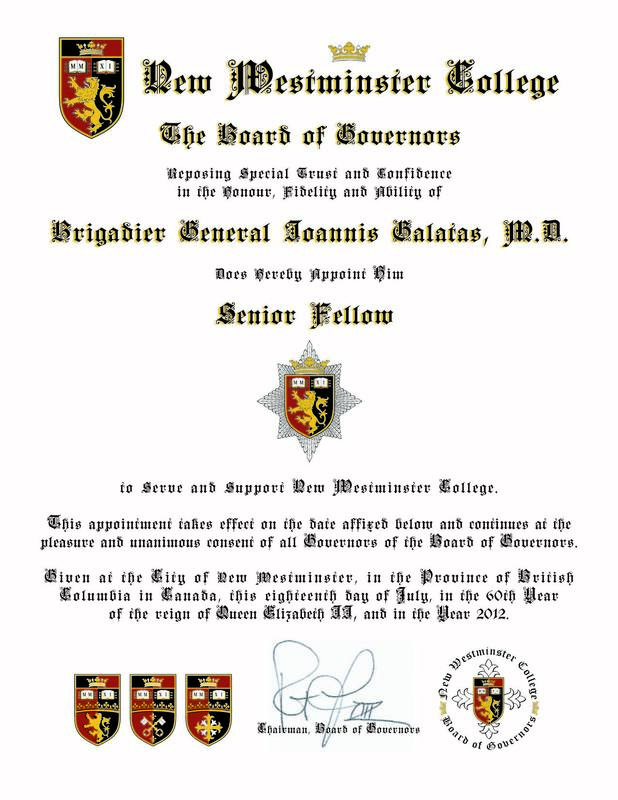 Editor has been appointed as "Senior Fellow" at "New Wedminster College", District of British Columbia, CANADA. Editor has been invited to give a lecture at the 4th Annual Conference of the Institute of Civil Protection and Emergency Management ( ICPEM) that will take place at Kettering Conference Center, Kettering, UK. Editor has been invited to give a lecture at the 2012 Counter Terror Expo. I am glad that the masterclass went well despite one or two teething problems. Most scores for both yourself and Russ Mansford were 5/5. There were only a couple of comments about the absent lecturers but the qualitative feedback was generally positive with notes such as ‘Very informative’ and ‘excellent’ penned. Thank you for your facilitation and for the quality of your work! Editor organized and participated as a lecturer at the "Tactical Combat Casualty Care for Armed Ship Guards Basic Masterclass" that took place at Simuland Medical Simulation Center in Athens for Poseidon Maritime Security & Services Co. Issues covered: Piracy in the Horn of Africa, Lessons Learned from Past Conflicts, First Aid Kit for Armed Guards and Basic Principles of First Aid under Fire. A practical demonstration and hands-on training followed the theoretical part of the Masterclass. 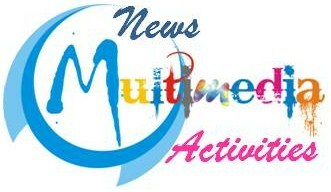 A full day hands-on training will follow in April 2012. Editor contributed a paper for the coming issue of International Journal of Emergency Management (IJEM) entitled "2012 Olympic Games - Terrorist CBRE threat estimate and medical response". Editor has been invited to give a lecture at the 2nd CBRN-E Asia-Pacific Conference that will take place in Singapore. Editor has been invited to give a lecture on "Urban CBRN Response and Preparedness - Are we Ready?" at the "Olympic Scale Planning Conference" hosted by Emergency Planning Society & DCU Business School in Dublin, Ireland. The Editor has been invited to participate with a presentation at the pre-conference workshop of the Combat Trauma Innovation Conference 2012 that will take place in London, UK.